January 7, 2013 by iCepts Technology Group, Inc.
• Provide licensed users a singular view of the business from virtually anywhere through a variety of clients. A customer needs to license one Starter Pack per ERP Solution deployment. 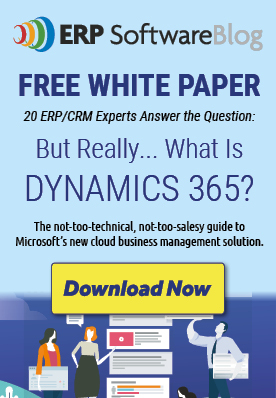 For many customers, this is the only Microsoft Dynamics license component they will need. The Starter Pack is for companies who need core financials and trade functionality - Including - Basic Financials Management (General Ledger and Fixed Assets) - Basic Supply Chain Management and Basic Sales Management (Sales, Purchasing, and Inventory) - with a wide set of Business Insight and reporting functionality as an integral part of the product. Additionally the Starter pack comes with a wide set of tools to customize the solution to meet the needs of every customer together with deep integration opportunities to be made through web services. Note: A single Microsoft Dynamics ERP solution (also referred to as the “system database”) may utilize resources from multiple servers or processors. Note: Licenses for additional software required for the solution, such as Microsoft Windows Server, Microsoft SQL Server, and Microsoft SharePoint Server are not included with the Starter Pack license. Such additional software must be licensed according to the applicable license terms. The Extended Pack Functionality option increases NAV 2013’s financial management performance through features such as: Intercompany Postings, Responsibility Centers and Cost Accounting. Powerful financial reporting tool which can help accountants and financial analysts to extract the most essential business data from the chart of accounts, budgets, cash flow accounts and cost types into financial reports, which can be used to efficiently monitor the health of the business and provide valuable input for the business decision makers. You get to choose the accounts you want to monitor and report on, change the order of the accounts, and combine figures in various ways, set up which columns to print, change the description of the accounts and supply them with additional notes. In addition, you can make simple calculations on the data you selected on the accounts schedules worksheet, compare current figures with historical ones and with your budgets. On top of that you can build more sophisticated reports which present data split by dimensions, responsibility centers and date periods, giving you in-depth view on the state of your business from a variety of different angles. Once the accounts schedule is prepared – you can observe data directly inside the product; using the Acc. Schedules Overview page, you can choose to export it into Excel or even have it displayed as a multidimensional graphical chart on your Role Center. With this feature you have full control and overview of your business accounting, margins and growth. • Facilities for internal and external reporting. • Approval of sales and purchase documents. • Posting and reporting in your company’s base currency. • Posting and reporting in an additional currency with the addition of the Multiple Currencies granule. • Capability to export data from any form to Microsoft Word or Microsoft Excel® using style sheets. • Capability to link to external documents. • Two languages—U.S. English and one other. • Set up sales and purchase documents archiving. Allocate general ledger entries to combinations of accounts, departments, and projects using allocation keys based on amount, percentage, or quantity. Work with budgets in general ledger accounts. After you have created a budget, you can print a balance that shows variances to the budget by percentage. Work with multiple budgets at one time. For example, work with a 100 percent budget, a 110 percent budget, and so on. Budgets are generally entered per period for the relevant general ledger accounts. Powerful financial reporting tool which can help accountants and financial analysts to extract the most essential business data from the chart of accounts, budgets, cash flow accounts and cost types into financial reports, which can be used to efficiently monitor the health of the business and provide valuable input for the business decision makers. You get to choose the accounts you want to monitor and report on, change the order of the accounts, and combine figures in various ways, set up which columns to print, change the description of the accounts and supply them with additional notes. In addition, you can make simple calculations on the data you selected on the accounts schedules worksheet, compare current figures with historical ones and with your budgets. On top of that you can build more sophisticated reports which present data split by dimensions, responsibility centers and date periods, giving you in-depth view on the state of your business from a variety of different angles. Once the accounts schedule is prepared – you can observe data directly inside the product using the Acc. Schedules Overview page, you can choose to export it into Excel or even have it displayed as a multidimensional graphical chart on your Role Center. With this feature you have full control and overview of your business accounting, margins and growth. Consolidate companies in Microsoft Dynamics NAV. The companies can come from one or from several different Microsoft Dynamics NAV databases or other files, and you can import and export financial information in this granule. If data used is retrieved from several Microsoft Dynamics NAV solutions, use this granule only in the parent company. • Capability to map your general ledger to XBRL taxonomies so that the same XBRL document instance can be used for various purposes, independent of the format required by the receiver of the document. • Support for the XBRL 2.1 Specification released by the XBRLConsortium. Log user changes made to Microsoft Dynamics NAV "Navision" ERP master data. You can log all direct modifications a user makes to the data in the database, except for changes to “working documents” such as journals, sales orders, and purchase orders. The change log functionality makes it possible to get a chronological list of all changes to any field in any table (except those “working documents” just mentioned) and to identify by user ID who made the changes. Cash Flow forecast provides a prediction of how a company’s liquidity – cash and other treasure positions – will evolve over time. It consists of two things – cash receipts and cash disbursements – the money you expect to receive and the cash you expect to pay out – plus the liquid funds you have available. These elements together show you a direct cash flow forecast. Keep track of fixed assets such as buildings, machinery, and equipment. You can also post various fixed-asset transactions: acquisitions, depreciation, write-downs, appreciation, and disposal. For each fixed asset, you set up depreciation books in which the methods and other conditions used for calculating depreciation is defined. You can set up an unlimited number of depreciation books to satisfy legal requirements, and for tax and internal accounting purposes. This granule is well suited for international companies that need to use many depreciation methods. Keep track of insurance coverage and annual insurance premiums for your fixed assets and easily determine whether your assets are under-insured or over-insured. You can attach each asset to one or more insurance policies and also index insurance amounts. Record maintenance and service expenses for each fixed asset. Get the detailed information you need to analyze and make decisions about the renewal and disposal of fixed assets. Allocate different percentages of fixed asset transactions, such as acquisition cost and depreciation, to different departments or projects by using allocation keys. Useful for when several departments share a fixed asset. Reclassify a fixed asset or part of a fixed asset—for example, from one department to another. You can split one fixed asset into several fixed assets, or combine several fixed assets into one fixed asset. When you need to dispose of one part of a fixed asset, you can split it into two assets and then dispose of the appropriate one. Create, operate and manage multiple bank accounts for catering to your diverse business needs and across different currencies. Generate Computer printed checks with unique number series for each bank account. You can specify on the payment journal line whether you want this payment to be made with a computer or a manual check. Assists internal control by ensuring that the computer check is actually printed before posting the Payment. Check printing comes with flexible user options like voiding a check, Reprinting, Using check forms with preprinted stubs, testing before printing and also a possibility to consolidate payments for a vendor into a single check. Reconcile your bank accounts in Microsoft Dynamics NAV with your statements. Apply amounts from your bank account ledger to the reconciliation form and keep track of all bank statements. Manage accounting for more than one company in the same posting process. The companies can be in the same or in one of several different Microsoft Dynamics NAV databases. You can also send documents to partner companies. Users control the document flow through an Inbox/Outbox feature, and transactions are completed as general journal transactions or through receivables and payables, which enables the use of currencies and correct reconciliation. Set up profit centers and/or cost centers. A company can sell items with specific prices and that are related to a responsibility center. You can tie a user to a responsibility center so that only sales and purchase documents related to the particular user are displayed. Users get assistance with entering extra data, such as dimensions and location codes. Cost Accounting provides an efficient way to control the company’s costs by providing visibility and insight into budgeted and actual costs of operations, departments, products, and projects. Cost Accounting synchronizes cost information with the general ledger, and then allocates that information to different costs centers and cost objects. Transfer costs from general ledger. Enter and post internal charges and allocations directly into he Cost Accounting Cost journal. Cost budgets and transfer cost budget entries to actual entries. Posted by iCepts Technology Group-A Microsoft Dynamics NAV Gold Partner in the Mid Atlantic Area serving Pennsylvania, Maryland, New Jersey, Delaware, New York and Virginia. Do You Know the History of ERP? Aderinto, the Starter Pack is $5,000 for 3 concurrent users. This is the minimum. Although currently there is a 40% off promotion. Each additional user is $3,000 each for a full user or $600 for a read only user.